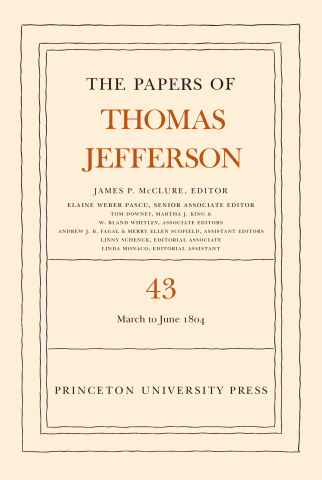 After the congressional session ends, Jefferson leaves Washington and goes home to Monticello, where his ailing daughter Mary dies on 17 April. Among the letters of condolence he receives is one from Abigail Adams that initiates a brief resumption of their correspondence. While in Virginia, Jefferson advances work on his mill and the house at Monticello and immerses himself in litigations involving land. Back in the capital, he finds that he must reconcile differing opinions of James Madison and Albert Gallatin to settle a claim for diplomatic expenses. He corresponds with Charles Willson Peale about modifications to the polygraph writing machine. He prepares instructions for an expedition to explore the courses of the Arkansas River and the Red River. William Clark and Meriwether Lewis send him maps and natural history specimens from St. Louis. The geographer and naturalist Alexander von Humboldt visits Washington. News arrives that a daring raid led by Stephen Decatur, Jr., has burned the frigate Philadelphia to deprive Tripoli of its use. Jefferson is concerned that mediation by Russia or France to obtain the release of the ship’s crew could make the United States appear weak. Commodore Samuel Barron sails with frigates to reinforce the squadron in the Mediterranean. Jefferson appoints John Armstrong to succeed Robert R. Livingston as minister to France and attempts to persuade Lafayette to move to Louisiana. In Paris, Napoleon is proclaimed Emperor of the French. Jefferson has “brought peace to our Country and comfort to our Souls,” John Tyler writes from Virginia. “Aristides” (pseudonym). See Van Ness, William P.
Jefferson commends the Algerian ruler’s “attachment to the Treaty which binds us together,” promises to send cannons and naval stores, and reports that additional U.S. frigates will be sent to the Mediterranean Sea in a show of strength against Tripoli.